While at Comic-Con for a big presentation in Hall H (you can read our recap of the film’s panel here, and a recap of Marvel’s new announcements here), co-writer/director Shane Black and actors Robert Downey Jr. and Don Cheadle were joined by Marvel’s Kevin Feige to talk to press about Iron Man 3, which kicks of Phase 2 of Marvel’s grand plan. 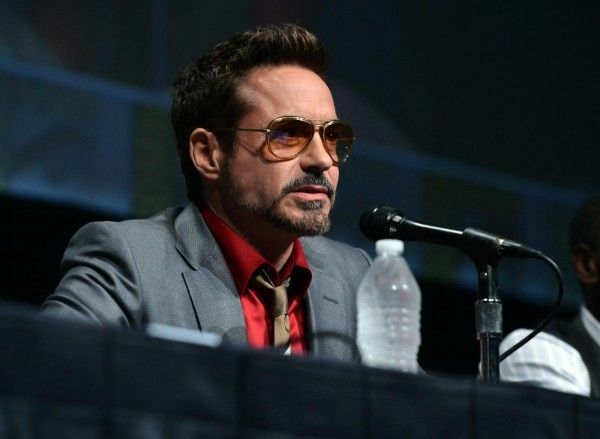 During the interview, they talked about the desire to capture and double the intensity of The Avengers, the sides of Tony Stark that they want to dig into this time, making the film its own story, what made Shane Black the right director for the job, the importance of the romance to the story, and keeping all of these films fresh for audiences, so that people don’t feel overloaded by Marvel films. Check out what they had to say after the jump. Also, check out our recap of the Marvel Update and Iron Man 3 panels. Question: The Avengers had such great action and set pieces. What is the pressure for Iron Man 3 to have bigger set pieces and live up to that level? KEVIN FEIGE: We’re not aiming for bigger, necessarily. We’re aiming for different and fresh and new. SHANE BLACK: There is an idea about being big, but to me it’s an idea about capturing and doubling the intensity that The Avengers managed to capture. It’s that lightening in a bottle feel of really stuffing so much into a limited space. We’re trying to get as much in this, as we can. We’re just looking to get a ton of thrills in a short space, and make a nice little stew for you. Kevin and Shane, can you talk about the Iron Patriot rumors, the picture that was online, and how that fits into the film? FEIGE: The not fun thing is that it’s online and you don’t have a whole lot of control over that stuff anymore. The fun thing is that the reason it was online is because it’s a real practical suit. It was on the set and someone took a picture of it. It’s actually an awesomely designed suit that Mr. Cheadle does get to wear, in certain points of the movie. BLACK: The good news and the fun thing for us, just in terms of the fans and the fan blogs, is just how much all the guessing is so wrong. It’s completely off base. We should just get someone to walk around as the most obscure Marvel villain ever, or get some costume at K-Mart and have that show up. But, we love the rumors. That’s fun! Shane, you’ve written a lot of big movies for other directors and producers. Did that prepare you for directing your own big movie? What’s surprised you about being on the director’s side of things? BLACK: What surprised me, frankly, was just how much generous help was available to me. That made it as easy as it could be. Jon Favreau was available to give me all kinds of tips and advice. He just made it like walking off of one platform, onto another and gave me the transitional feel that I needed. Marvel has such an affective special effects machine that they could walk me through this process, hold my hand, and ensure that I was free to concentrate on story and character and scale. I said, “I want to do this,” and they said, “Here’s how you do it,” and within a week, I knew. They’re terrific! They’ve done this a lot. They do it all the time. Robert and Shane, how did the storyline and the success of The Avengers impact what you wanted to do with this movie, and what did you want to dig into with Tony Stark this time? 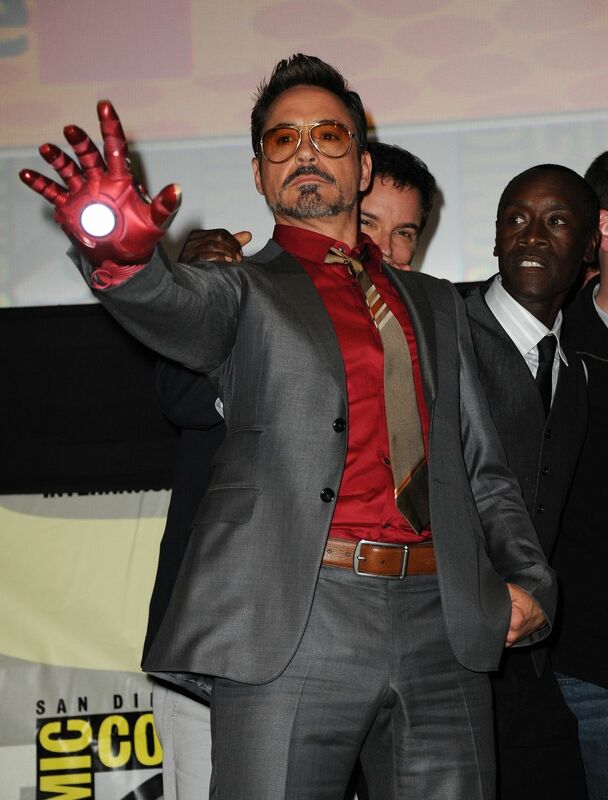 ROBERT DOWNEY JR: The Avengers even surprised us, to a certain extent. Looking back on it, you can dissect why it was the right movie with the right people and the right director, at the right time, and we feel the same way about this now. I feel that Rhodey and Tony had not entirely been explored as much as they could be. That was always a big part of the comics, and the heart of it. We also tried to be practical, in a post-Avengers world. What are his challenges now? What are some limitations that might be placed on him? And what sort of threat would have him, as usual, ignore those limitations? BLACK: Truthfully, the way to go about doing a part 3, if you’re ever in that position, as I’m lucky enough to be, is to find a way that the first two weren’t done yet. You have to find a way to make sure that the story that’s emerging is still ongoing and, by the time you’ve finished 3, will be something resembling the culmination of a trilogy. It’s about, “How has the story not yet been completely told?,” and I think we’re getting there. I think we’ve really found ways to make this feel organic and new, based on what’s come before, and that’s what I’m happy about. Shane and Kevin, Iron Man 2 really set up pieces for The Avengers movie. 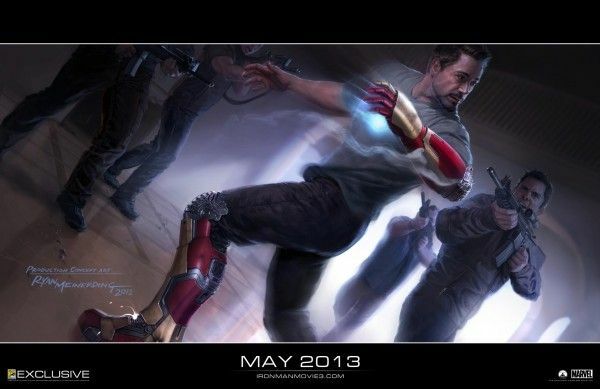 How is Iron Man 3 going to focus on Iron Man, rather than setting up the next Avengers? FEIGE: This is a very Tony Stark centric film, meaning not just Tony, but his world with Pepper and with Rhodey. 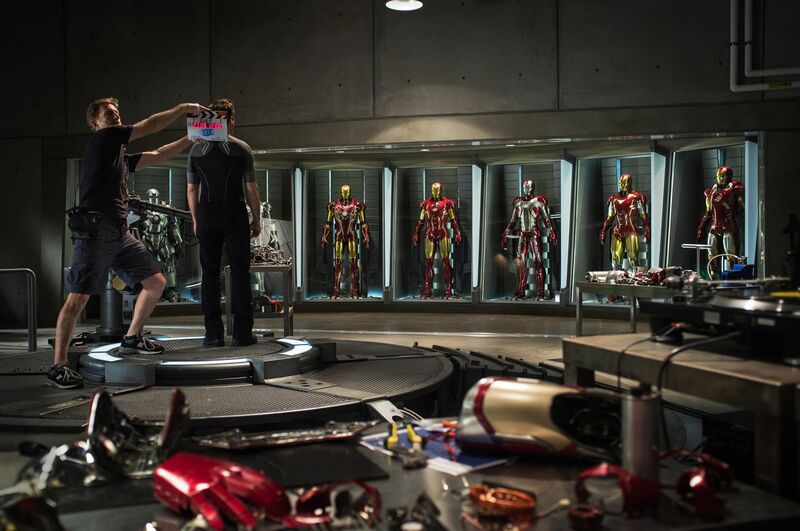 It was important to us, as part of the grand plan, from Iron Man 1 to The Avengers, to build that up. Frankly, the first step of the grand plan, with Iron Man 3, is to prove they’re just as interesting, if not more so, by themselves, as they were when they were all together in The Avengers. Iron Man 3, by design, is a very serious character study. It’s not a serious movie, but we seriously dug into exploring more of Tony, of Rhodey and of Pepper, without calling S.H.I.E.L.D. and calling Thor or Cap. Robert, how was it to re-team with Shane Black on this, after doing Kiss Kiss, Bang Bang? DOWNEY: Well, I’ve known Shane for awhile. Kiss Kiss, Bang Bang was one of my favorite experiences. The script was practically perfect, but we improvised, anyway. DOWNEY: The main thing is Shane’s storytelling, and that emotional depth that happens without taking itself too seriously. There were times when [Jon] Favreau and I would call Shane when we had a big scene the next day. His payment once was to have us get him a piece of salmon and some fresh blueberries. He became known as Code Word: Blueberries after that. And he works for the same fee now. Don, will we see you suit up again, in this film? DON CHEADLE: I do suit up. There are some different iterations that War Machine goes through, in this film. I don’t want to give them away, but it’s fun to see those things morph and shift. The Iron Man suit is really spectacular in this film, I think, with the innovation that’s happened with it. Robert and Shane, will there be more sides to Tony stark in this? DOWNEY: Yeah, I think that’s the big idea. But also, interestingly enough, this film has a lot of breadth to it. We realized, at the beginning of Iron Man 2, Tony was dying, and then he had a party, and then he was drunk, and some people were going, “We don’t like him!” There’s a way to enjoy all of that shadowy stuff. We just kept thinking about, “What would it really be like, if this guy was in this country? Where else could he go in this country? What sorts of themes and backdrops could we explore?” If you look to the history of the films that Shane has written and directed, there’s a real desire for me, just as someone who loves the movies, to harken back to some of those themes, and they will occur in Iron Man 3. BLACK: Although, Tony won’t fall off the wagon. DOWNEY: You haven’t seen my rewrites! Rhodey picks him up at Betty Ford, in Scene 2. Can you talk about filming in China and how that will be incorporated? BLACK: We’re not really going to China. Can I say that? DOWNEY: This is why I love Shane. He says it, and then turns to Kevin [Feige] and asks if he can say it. BLACK: Basically, we’re setting aspects of the film in China, but the First Unit won’t be filming there. But, don’t tell anybody. CHEADLE: That stays in this room. How do you ensure that this film doesn’t step on the toes of any larger Marvel projects? 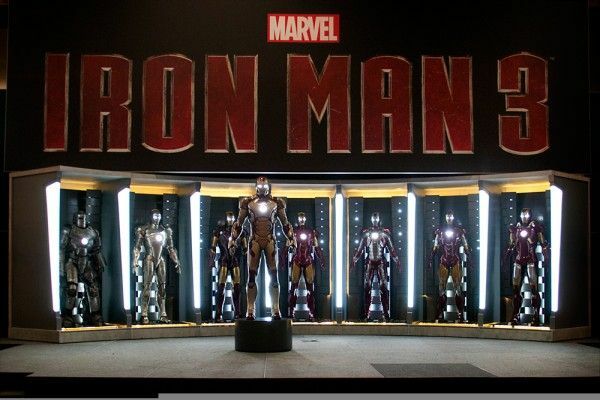 FEIGE: Iron Man 3 is the beginning of the next phase, so it will set the tone, in a lot of ways. Certainly, with Tony’s journey, things could spin forward, but it’s as self-contained a story that we’ve done since Iron Man 1. How important is romance to the story of Iron Man 3? BLACK: The remarkable thing that Jon Favreau managed to do when he forged these movies was establishing a precedent of espionage, high-tech, Top Gun style thrills, coupled with romantic comedy, in a strange way. That’s always been the mainstay of these movies. That’s one of my favorite things about it, too. The romance is definitely a part of it. We’ve got Gwyneth [Paltrow] coming back, and some time has passed. In The Avengers, Pepper and Tony are together and doing great, and living together. DOWNEY: Kevin said there’s never been a movie like this where the lead guy is in a relationship with the girl he’s going home to, who’s Gwyneth Paltrow, telling him what to do. However, Rhodes is single! What are we gonna do about that? CHEADLE: Is this a dating service?! Are you starting something? How do you guys keep all of these films fresh for audiences without people feeling overloaded by Marvel films? FEIGE: Well, I’ve been at Marvel for 12 years now, and we’ve had that concern, going back to when X-Men came out, and then two years later, Spider-Man came out. And then, in one year, there were three films. The trick and the formula is just trying to make great movies. We try to make them all great, all different and all fresh. What you’ll see in Iron Man 3, that Shane is bringing to it, is some very unique plot points and directions that were taken with the franchise. The same thing with Thor, and the same thing with Captain America. As long as they all feel fresh and you don’t fall into some sort of formulaic mold, I hope [people will want to see them]. BLACK: We were allowed to take some risks, and I think that’s very notable. I think it’s very admirable, in a superhero movie, to be able to take a few risks. That’s why I wanted to do this. Kevin, what made you decide on Shane Black to step in and direct this film? FEIGE: He’s a great storyteller and he had a great relationship with Robert. His movie was one of the things that Jon and I kept going back to, when we were casting Tony Stark, many years ago. It made a lot of sense to us. Joss [Whedon] hadn’t done a movie as big as The Avengers, before we hired him for The Avengers. We’re confident in the infrastructure we can provide filmmakers, whether they’ve dealt with something on this scale of not. BLACK: Oh, just say it. I work for DVD copies. CHEADLE: You were cheap, kid. Robert, how does it feel to be a hero in all these movies? CHEADLE: This better be a great answer! DOWNEY: Well, I think I can speak for any of us who get to live in this world. There’s something about it where you go, “What a great opportunity!” It’s an odd thing. I take it as seriously as Shakespeare.